In February, March and April of 2017, political violence pitting Left anarchist Antifa and Trump supporters exploded in the Battles of Berkeley. On August 27, 2017, chaos once again turned the streets of Berkeley into a war zone, as another relatively small rally of Alt-Right and Trump supporters quickly devolved into violent chaos and street warfare, when Antifa armies (including the Bay Area-based By Any Means Necessary) swarmed Martin Luther King Park in large numbers, attacked Trump supporters (deemed “Nazis”), and overwhelmed what police presence there was. The Berkeley police, severely criticized for standing down in the previous Berkeley incidents, initially maintained strict security measures, but “disappeared” or were driven out of the area, retreating to local stations as Antifa forces arrived. Who ordered the retreat of the Berkeley police? Outnumbered Trump supporters were swarmed and beaten. There were arrests, but much of the brutal violence went unreported. Was this event staged to trigger violence and social divisions? Tepid mainstream media accounts fail to capture the terrifying conditions reported on Twitter by those on the ground. 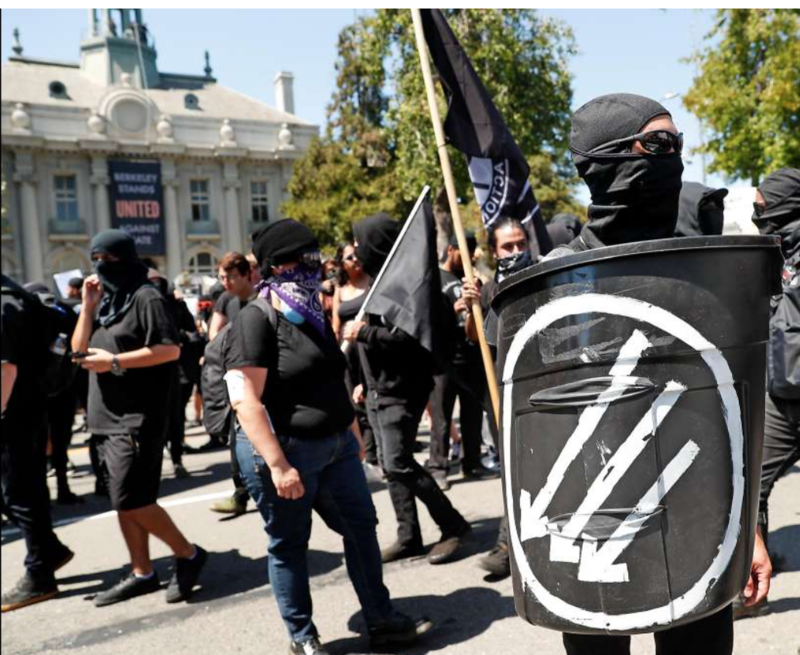 What has to be understood is that Antifa (self proclaimed Anti-fascists in black clad uniforms and boots) does not represent America’s progressive left. Quite the opposite, they are supported by corporate (tax free) foundations with a mandate to precipitate violence. The chaos agenda, the Purple Revolution to overthrow Trump, continues escalating. Masked anarchists rout right-wingers. Like sports. Subtitle: ‘Berkeley ‘No to Marxism’ demonstrators swamped by counterprotestors, some black-clad and violent’. Another article admits that the Berkeley police “backed off protesters” for “safety reasons”. What the article does not focus on in any sufficient detail is the fact that Antifa forces completely overwhelmed the area, and attacked people—some innocent, with no affiliation with either side—when the police “disappeared for safety reasons”. And never returned. These beatings are receiving major coverage in alt-media, but mainstream media has been studiously biased, deceptive and guilty of major omissions. Some accounts choose to portray brutal Antifa mob assaults as “mellow” peaceful expressions. The political establishment is so far relatively quiet, including from the Trump administration, or even supportive of the anarchists. 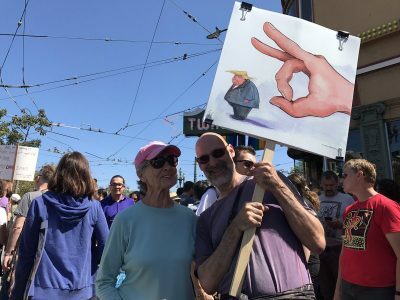 Democratic-aligned officials, particularly in the San Francisco Bay area, are openly applauding the “triumphant rout” of “Nazis and white supremacists”. Featured image is from @lizziejohnsonnn / Twitter.